Originally used for a wide variety of tasks, today's Dogue de Bordeaux is most commonly kept as a companion or to guard homes and property. 1)	Like the Bullmastiff, they are the result of a cross between the old Bulldog and Mastiff. 2)	An ancient breed, they are a close cousin to Neapolitan Mastiff. 3)	They descended from early Mastiffs crossed with the Spanish Alano. 4)	They descended from Tibetan Mastiff and Greek Molossus. 5)	Simply is an indigenous French breed that has been developed for over 2,000 years. It is known that in its early days the Douge de Bordeaux was bred to fight bulls, bears and other dogs. They have also been used as a war dog, guard dog and for driving cattle throughout the centuries. By the 1700s they were largely kept by nobility and the wealthy to guard estates and as a result their numbers were greatly reduced during the French Revolution. Although the breed was saved from extinction, it is believed that some Bulldog blood was added at the time in order to expand the gene pool. 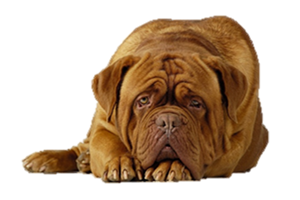 Is the Dogue de Bordeaux Right for You?